I’m pleased to say that the rainbow blanket was finished in plenty of time and presented on the approriate day. Here’s a little slideshow of the finished item. 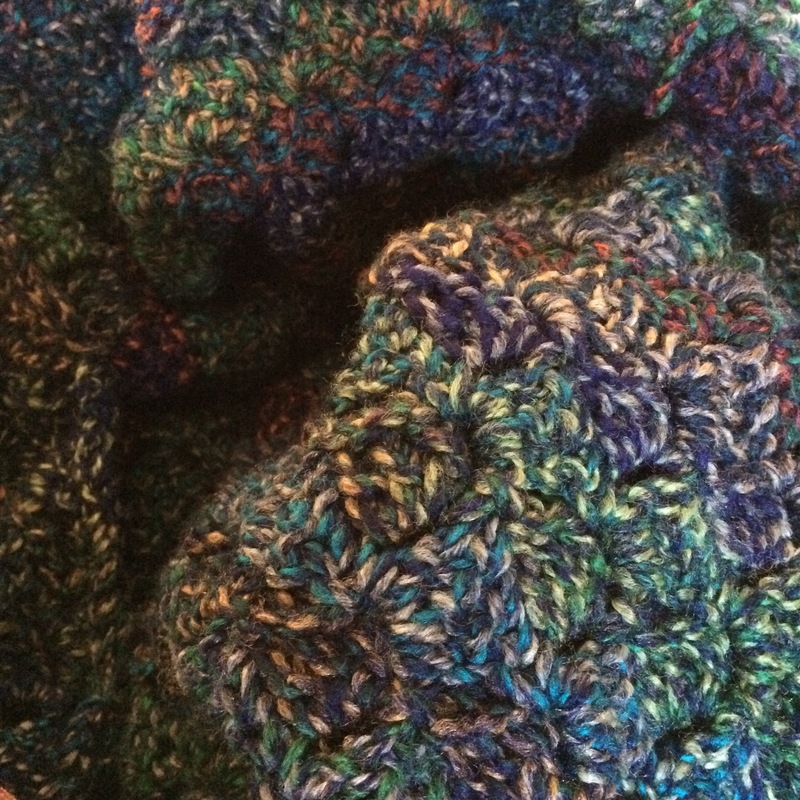 Two more blankets were also needed for Christmas – both equally well received. It’s always a relief, isn’t it! Well, even though I was cross about the short weight of the yarn I have to say that the Marble Chunky is making up into a lovely fabric. Today I managed to catch it in the light of the morning sun, and this gives you a much better idea of the mix of colours. It will be really warm and cosy. I’ve adjusted the size so I’m pretty sure I can finish it. I’d like to say that I’ll use the yarn again – but probably only if I can buy it over the counter. I need to know that I will have enough for the project in mind. 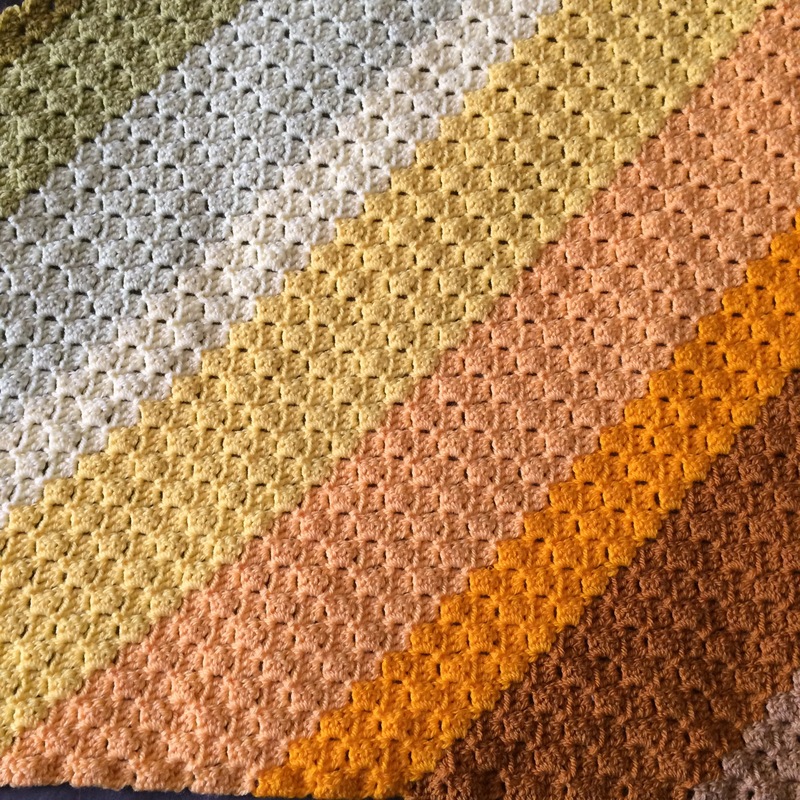 I’m well into the decreasing now, a good session of crochet should finish the square, and then I can start on the border. Of course, finishing a project always brings to mind the next one! I love planning a project, don’t you? I’m thinking about a couple, actually, but I’ll share one with you this morning – very much still in the planning stage. Over the last couple of years there has been a lot of talk about Temperature Blankets. I have so far resisted the temptation to join in for a couple of reasons – but mainly because I didn’t want to commit to long rows of daily crochet – in the knowledge that on many days I wouldn’t even get one stitch hooked. So this idea has been mulling around in my mind for some time, and I now have a couple of possible ideas. Well, these aren’t my favourite and although I might start off with enthusiasm, I know I will be bored quite quickly. I have a feeling I will also be bothered by the layout if I join as I go (which will be the only way to keep an accurate record) as there will obviously be no plan to follow. However, there is a way that it might work – and so, on to …..
Each year has 12 months (I guess you already knew that), so if I started a new block each month I would have a blanket made from 12 by the end of the year(ish). To this end I’ve been reading a lot of blog posts about temperature blankets and, taking into consideration the apparent pitfalls and my level of boredom, I’ve come up with a plan. A planned project always starts with samples, and therefore this is no exception. Firstly, the colours will be many! I’m not going to just stick with one shade of each colour to avoid enormous blocks of the same shade. This may not make sense at the moment, but once I actually start on the project it will become clear. 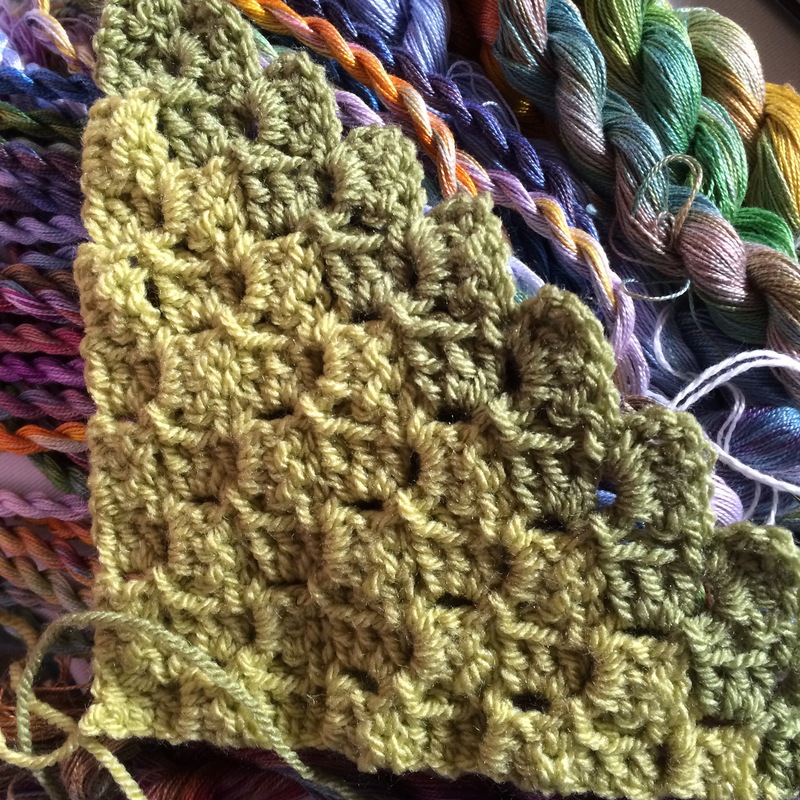 Secondly, I think I’ve decided to work in Double Crochet (UK) – that’s Single Crochet to those of you in the USA and more. Working on a base of 100 chain takes not much more than 10 minutes per row. I can commit to that on a daily basis, it won’t be difficult to catch up. I already record the weather each day on a couple of other sites (here and here) so it won’t be hard to add the temperature to my records. I don’t mind if the blanket is small, in fact I’d rather it wasn’t too big. 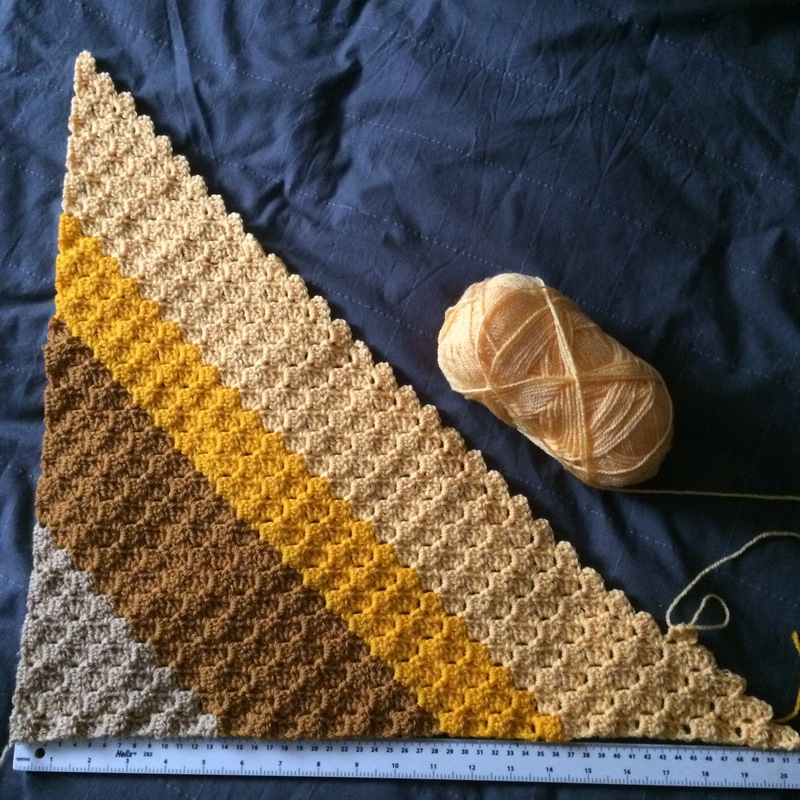 Author nuvofeltPosted on November 28, 2016 November 28, 2016 Categories Blanket, crochet, ThoughtsTags #crochetc2c, 2016, c2c, double crochet, James C Brett, November, Temperature Blanket3 Comments on Nearly there! Sssshhhh! Can you keep a secret? I currently have two projects on the go. I told you about one last time, but today I’m sharing a secret. I’ve started a new project which is being produced strictly under cover! I’m grabbing moments when a certain someone is otherwise engaged – and I know that that someone has no idea about this blog, so posting pictures here isn’t actually revealing anything. Hopefully this will be a very quick project! 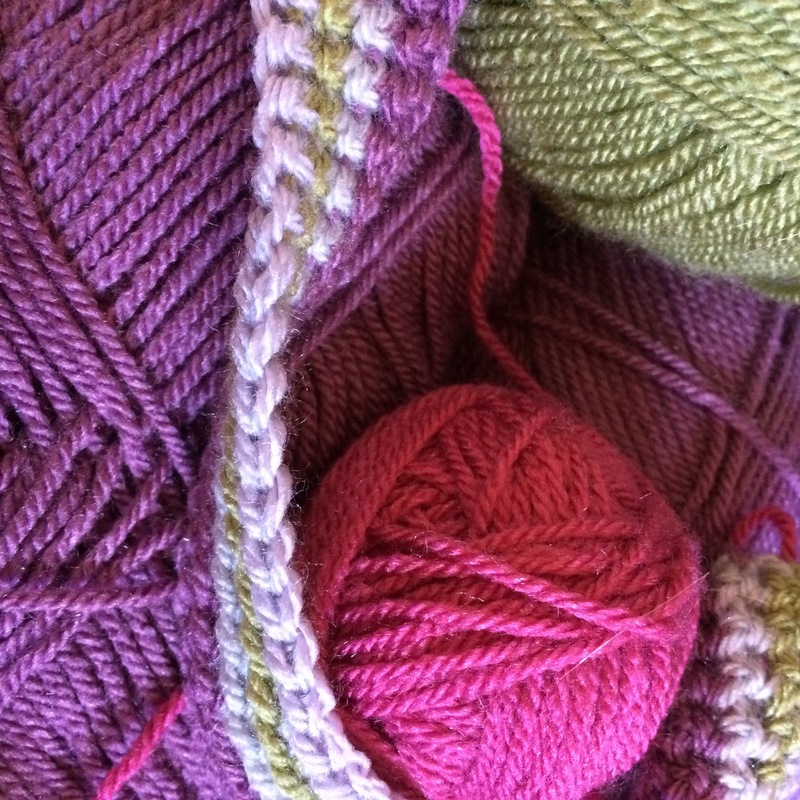 Instead of Double Knitting yarn I’ve chosen a Chunky by James C Brett – and it is truly growing apace! Forgive the crumpled cloth, but it was photographed in an instant with no real thought to background! Above is just one short evening’s work! Maybe it will be finished in record time! Author nuvofeltPosted on November 16, 2016 Categories Blanket, crochet, This and ThatTags 2016, blanket, c2c, Chunky, corner to corner, crochet, James C Brett, wip, work in progress1 Comment on Sssshhhh! Can you keep a secret? The start of another project is always exciting. Underneath the crochet you can see some of the hand dyed threads I’ll be offering for sale this weekend. Packaging takes a lot of time- there won’t be much blanket progress for a day or two. Did you know I am a dyer? I’ve been creating collections of hand dyed threads etc for over 20 years. Search for Sassa Lynne and you will see. More information at the weekend or join my little Facebook group. Author nuvofeltPosted on November 10, 2016 Categories Blanket, crochet, This and ThatTags 2016, blanket, corner to corner, crochet, November, Stylecraft, wip, work in progress1 Comment on And we are off again!